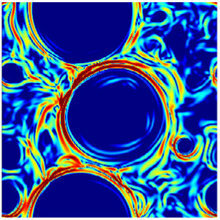 We use the Navier–Stokes–Cahn–Hilliard model equations to simulate phase separation with flow. We study coarsening — the growth of extended domains wherein the binary mixture phase separates into its component parts. The coarsening is characterized by two competing effects : flow, and the Cahn–Hilliard diffusion term, which drives the phase separation. Based on extensive two-dimensional direct numerical simulations, we construct a flow-pattern map outlining the relative strength of these effects in different parts of the parameter space. The map reveals large regions of parameter space where a standard theory applies, and where the domains grow algebraically in time. However, there are significant parts of the parameter space where the standard theory does not apply. In one region, corresponding to low values of viscosity and diffusion, the coarsening is accelerated compared to the standard theory. Previous studies involving Stokes flow report on this phenomenon ; we complete the picture by demonstrating that this anomalous regime occurs not only for Stokes flow, but also, for flows dominated by inertia. In a second region, corresponding to arbitrary viscosities and high Cahn–Hilliard diffusion, the diffusion overwhelms the hydrodynamics altogether, and the latter can effectively be ignored, in contrast to the prediction of the standard scaling theory. Based on further high-resolution simulations in three dimensions, we find that broadly speaking, the above description holds there also, although the formation of the anomalous domains in the low-viscosity–low-diffusion part of the parameter space is delayed in three dimensions compared to two.